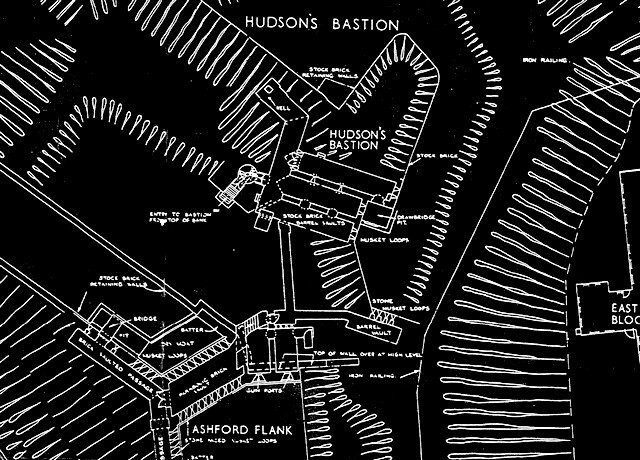 Hudson's Bastion is the most complex of the 19th Century defences in Dover Castle's East Ditch. It comprises the fortified bastion earthwork itself, with an underground guardroom, a large caponnier flanking the ditch and a long, two-level loopholed musketry gallery. The entrance to these outworks from within the castle is through a long tunnel, known as Hudson's Passage. The underground sections of Hudson's Bastion remain in good condition and are an excellent example of 19th Century fortification. Unfortunately, there is no current public access to the bastion, this was a special visit arranged by the Friends of the Castle.